Verwood reversed their recent run of disappointing form with a fine display from both forwards and backs running in a total of 11 tries against bottom of the table Stoneham for whom it is likely to be a long and tiresome season ahead judging by their performance. 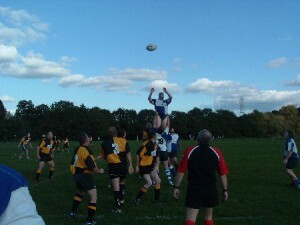 There is not doubt that Stoneham are missing their maverick scrum half Andy Stride. The highlight of the afternoon was to see second row Darren Clarbull, with over 500 club games for Verwood, score his first try at home for his Club. Albeit a short range affair, nevertheless a try from 2 metres feels just as good as a 50 yarder. This was a perfect day for the ball to be thrown around and Verwood did this aplenty. It is not surprising, that apart from the enterprising Clarbull, all Verwood’s other tries were shared amongst the backs with fly half Charlie Cockram scoring a hat trick. His kick and chase on halfway being the pick of the bunch as the ball sat up perfectly for him to glide over unopposed under the posts. Veteran full back Dave Hockaday was in good kicking form with his boot, converting three difficult conversions and showing that he was still full of running, entering the backline attack at every opportunity. Matt Pike also showed what a good outside centre he is if given the ball early and the opportunity to take his opponent on one on one. He too scored three tries and his third was a joy to behold. A long pass from Cockram on Stoneham’s 22 picked out Pike who stepped inside off his right foot to find the gap and run in under the posts. At the close Stoneham scored a well deserved consolation try as they competed manfully all afternoon.